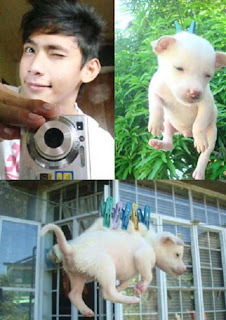 Jerzon Senador, who became famous after getting a lot of tirade online for pinning his puppy to a clothesline and posting pictures of it online, is now facing legal charges for animal cruelty. It will be remembered that in June of 2011, Senador, in his attempt to become famous, posted a picture of his unlucky puppy hanging on the clothesline after bath with the description “Bagong Ligo si Puppy”. Now, after almost a year, the Municipal Trial Court of Calamba, Laguna issued a warrant of arrest against Senador for violation of Republic Act 8485 or the Animal Welfare Act. However, the Philippine Animal Welfare Society (PAWS) said when the police arrived at his Looc address, Senador was nowhere to be found. His parents even said that their son has left home and that his present whereabouts are unknown to them. PAWS is now seeking help to find information leading to his arrest. RA 8485 states that upon conviction, Senador will be punished by imprisonment of six months to two years or a fine of P1,000 to P5,000 or both. Hanging a cute puppy like this can be also considered as animal brutality. It may be fun to look at but they also have feelings and they also felt hurt physically. Try to take care of your pet.